Here the conductor decides to lower the electronic sound of the strings before the clarinet enters. After the clarinet has entered the conductor decides to play with the possibilities of the ConDiS by increasing and decreasing the electronic volume or in musical terms make a crescendo and diminuendo at the beginning and end of each sustained multiphonic of the Clarinet. This is a perfect example of a very positive and musical use of the ConDiS technology. Here the conductor is molding the sonority of the instruments and electronics using her musical talent to create a live “conversation” that would be impossible without live interactivity such as is available through ConDiS. In the next example from measures 83-90, we get an example where instructions of volume value control have been written in the Score. As mentioned before the composer gave the conductor no other information or instructions on how to conduct and control the volume value during these measures. As can be seen from the video clip the conductor activates the volume control close to the given point and starts by decreasing the volume. Then when in full control she decides to give it a little bit of crescendo then a bit more and finally before deactivation she makes a diminuendo to her chosen volume level. Since there is a written volume value change just a few measures after the last one it is interesting to watch and hear how the conductor responds. Here is the next example. At this spot, the conductor activates the electronics in a very high arm position. That means she has almost no headroom to increase the electronic volume value but plenty of room to lower it. The outcome is that the electronic volume level goes down from the last level being approx mf (mid-strong) to almost nothing or silence. Although the conductor then raises her arm a bit it does not give much feedback since it is already very low. For me personally, this is not what I was expecting. 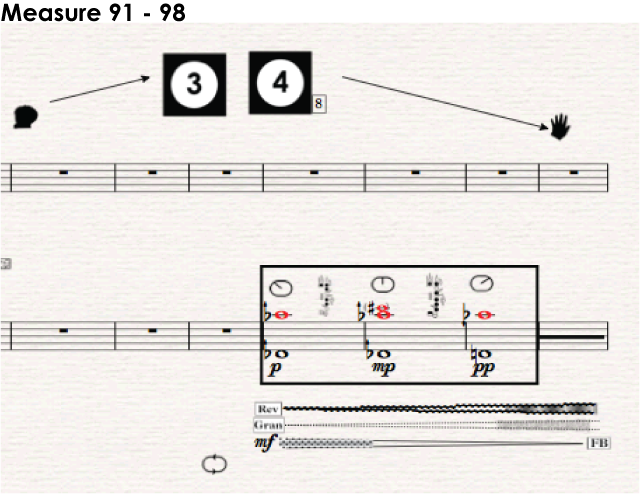 My expectation was that the conductor would play more with the interaction as she did in the last example (example 5). Meaning that she would activate the volume control with her arm in a low position and raise the electronic volume to a somewhat maximum point before lowering it an play. This makes me wonder if the conductor is consciously or unconsciously on the brake, holding back, taking precautions against the risk of causing feedback. During rehearsals and also during the first performance in November we did have few incidences of feedback. It turned out that the conductor had a very sensitive ear for feedback and had a constant fear of it to happen again throughout the Nordic Tour. 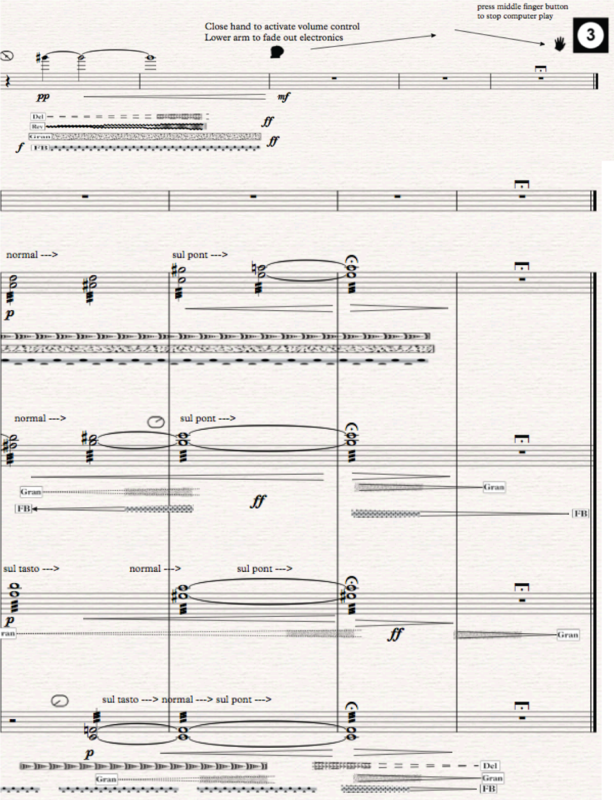 The last example shows the closing measures of the first movement where I write instructions to the conductor to activate the volume control and then lower arm to fade out the electronics at the end. From the way, I write the instructions (also in other examples with volume control) it can be understood that I do want the conductor to activate the volume control then raise her arm an thereafter lower it for a fade out. 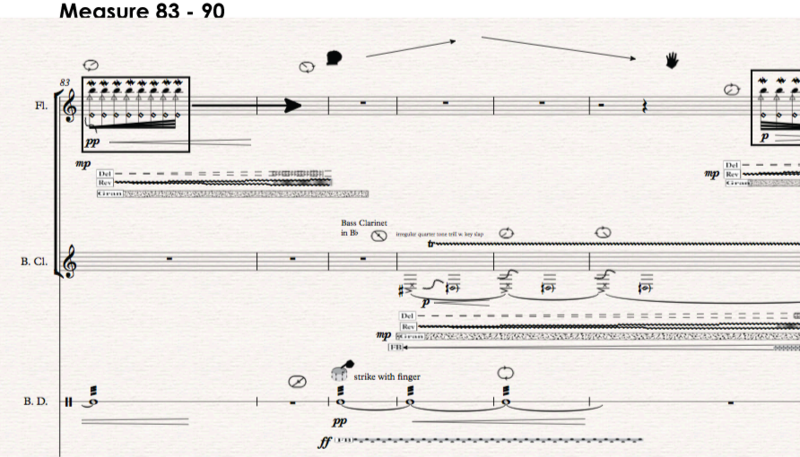 Honestly, it is exactly what I was aiming for, I really wanted the final measures to show clearly the relationship between the conductor’s gestures and audible electronics. Let’s see and hear how it goes. It goes exactly as written, but!. The conductor activates the volume value control with the arm in the lowest possible position and then raises her arm up to approx max level before lowering it for the final fade out. This conducting gesture was exactly what I wanted but I was expecting more reaction from the electronics i.e. there would be action, more volume changes. What went wrong? why was there not more powerful response from the electronics? Unfortunately, I did not video record the monitor of the laptop with the Volume control slider showing the levels. There is a slight possibility that the slider did not go all the way up to maximum level when the conductor raised her arm. During the test period with Halldis, it did happen occasionally that the slider did not respond to full extend something that seemed to happen when she would move her arm too quickly. That was not causing a problem during rehearsals or the other concerts, and as can be seen looking at the video the conductor moves her arm slowly and steadily from the lowest position to the highest. Looking at the automation levels of the electronic effects in the DAW, at first sight, it seems that all parameters are open enough to have more response. Closer look leads me to the conclusion that I might have to be more extreme the feedback and dry/wet level should be higher for the delay, the volume level higher for the procrastinate delay/feedback e.t.c. Something worth working on for the final performance of my artistic research project scheduled for November 2018.